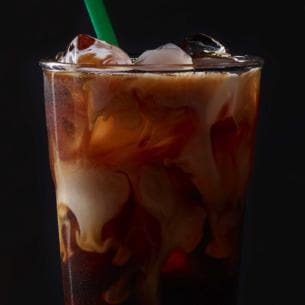 Freshly brewed Starbucks® Iced Coffee Blend with milk – served chilled and lightly sweetened over ice. Ice, Brewed Coffee, Milk, Classic Syrup [Sugar, Water, Natural Flavors, Potassium Sorbate, Citric Acid]. Iced coffee can be sweet, mellow or sharp. It can be a cold wake-up beverage in the morning or a treat on a long summer's night.